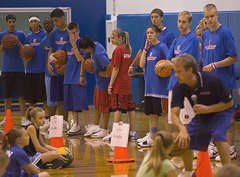 Advantage Basketball Camps was created based on the life experiences and philosophies of founder Michael Hummel. With his guidance, Advantage Basketball Camps has become one of the most successful and Largest youth sports camps in the World. Michael Hummel was born and raised in the Seattle, Washington area. His early childhood was an unhappy one, with a mother sick with cancer and a father who was not involved. Left to his own devices without much parental guidance, Michael essentially raised himself. Diagnosed with Tourette Syndrome, a perplexing neurological disorder that causes repeated and involuntary body movements (tics) and uncontrollable vocal sounds, Michael met with challenges at school, at home, and on the street. Even at an early age, Michael frequently found himself in trouble at school. In fifth grade, he got into a fight in the school gym. The fight was broken up by coach Winners. In part to distract and punish Michael for the fight, Coach Winners ordered him to pick up a basketball and begin dribbling and shooting. That day, like a drill sergeant, Coach Winners put Michael through his paces, turning Michael's anger into positive energy. When he finally saw that Michael had learned his lesson, the Coach sat down and, in a few short words, changed the course Michael's entire life. "Michael, you are special. You have a real gift for playing basketball. I've never seen someone work so hard. I want to see you back here again tomorrow; you're playing for me now." This was the first time anyone had ever told Michael that he had value. The aptly-named coach saw through Michael's emotional turmoil to his inner potential. To the present, Michael credits Coach Winners with saving his life. Over the next three years, Michael's family life was filled with challenges. Yet during this time, despite the setbacks, Michael devoted himself to his game. He walked to and from practice through sun or rain or snow to practice. He played through injuries, illnesses, and personal challenges. What mattered most to Michael was his developing passion for the game of basketball. While his Tourette Syndrome condition initially made consistent movements like ball handling difficult for Michael, at the same time, the compulsiveness associated with TS also allowed him to focus on practicing dribbling for hours on end. The repetitive drills that Michael created for himself would lay the foundation for Michael's teaching methods. As Michael entered high school, his future as a basketball star looked very promising. His skill level far exceeded other players his age. But Michael could not escape his life off the basketball court. Injuries and family problems plagued him. In yet another fight, Michael's left knee was shattered by a baseball bat. His future as a basketball player was in doubt. Michael's persistence emerged again. He spent a year rehabilitating his knee with painful and unrelenting therapy and exercise. During this time, Michael never gave up developing his ball-handling skills. He focused on his dream of playing on the high school team. Then another fight, this time with his own older brother, damaged Michael's knee permanently. Surgery was required and the only solution was to replace Michael's knee. His promising basketball future was gone. Deteriorating family conditions led Michael to drop out of school and leave home. He wound up living in a bunk house and working for room and board on a ranch in Montana. At 18, he returned home briefly, but didn't stay. For the next seven years, Michael traveled, working at odd jobs, unsure of his direction or his future. Then at age 25, Michael returned to Seattle and started his own business – H&H Excavating. At the same time, he also fell in love and married. His stepdaughter, Melissa, asked Michael to help her learn to play basketball. She showed great talent for the game. Melissa then asked him to help her team. The moment he stepped onto the court, he felt something. Michael knew he was not meant to play basketball. All the lessons of his childhood dream of being a star player – all the training, practicing, learning, drilling – had prepared him instead for this. Rather than being a player, Michael knew in that moment that being a coach for children was his true calling. Shortly after getting involved in coaching Melissa's team, Michael was elected president of the South County Youth Basketball Association (SCBA). He helped Melissa develop her skill level to the point where she was miles ahead of the other girls in the recreational league that Michael was now running. Michael wanted her to be able to play basketball at a higher level, so he decided to help her join the Amateur Athletic Union. Michael quickly learned that AAU only existed for boys in Washington. He was outraged. The girls deserved the same opportunity to pursue their dreams as the boys did. Michael then began a campaign with AAU for girls. At the same time, Michael and his wife learned they had their first child on the way. He also had just added a second business, Seattle Building Maintenance, to his corporation. These involvements and continuing to manage the SCBA did not leave a lot of time. However, driven by his childhood memories, he set out to start AAU for girls in Washington. Michael hired attorneys and accountants and set up a non-profit corporation: AAU Washington Girls Basketball. By this time, Michael's SCBA league had grown to 40 teams. He could no longer manage the league, yet he would not simply abandon the children. Michael approached Alderwood Boys & Girls Club for help. They also only had a boy's basketball program and offered nothing for the girls. Michael donated enough money and equipment to the Boys & Girls Club for them to start a girls program. He then turned the girls teams and gym times from SCBA over to the Boys & Girls Club so he could focus on starting and building AAU. The Boys & Girls Club, however, did not start a girls program that season as they promised. Instead, they took the donated money, gym time, and equipment and gave it to their boys program. This left the SCBA girls teams with no league and no gyms. With the help of an attorney and the threat of a discrimination lawsuit, Michael persuaded them to change their minds. The following season, the Boys & Girls Club rolled out an impressive campaign to continue the new girls basketball program. And Michael successfully launched his first AAU season for the girls. At this point in Michael's life, with his second child on the way, Michael added his third business to his corporation, Arnold's Hay & Grain, a wholesale and retail farm and pet supply store. The addition of this new business slowed Michael's pursuit of working with and helping kids. Michael turned Arnold's into the largest volume feed supply store in western Washington. But Michael wasn't happy. His priorities were all out of balance. He put his businesses and the AAU league above his faith, his family, and his health. As is typical when life is out of balance, bad things happen. Michael's wife left him. At the same time, the money from all three businesses disappeared. With every available penny gone, combined with the legal mess from the impending divorce, Michael had to file bankruptcy. What Michael viewed at the time as tragedy, turned out to be one of the biggest blessings of his life. He was able to get his life back in order and his priorities straight. Michael found himself with custody of two young children, no money, and no job. He also found himself with the freedom and time to finally pursue his dream and passion full time. Michael focused on raising his kids and creating his basketball camp. Previously, Michael had coached children just for the love of it. But now he created a business from his love, with a more formal structure as a corporation. He started charging a fee for attending his basketball camps. For the first time in 8 years he started taking a small salary for running his basketball league. This gave him enough money to raise his kids. It also provided him with the time and motivation to pursue increasing his knowledge of the game of basketball and how children learn. Michael called on a number of the best high school and college coaches for interviews. With some, he volunteered to work with them. With other he was able to just watch them. He met and spoke with child education specialists. He developed a system for teaching children, not only about the game of basketball, but about how to better themselves. Michael organized and coached teams. He took these teams on to compete at the local, State, and National level. His system worked. 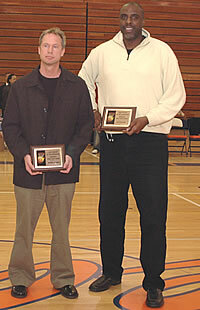 Over the last 20 years Michael has been fortunate enough learn from some great AAU, high school, and college coaches. His own experience at all levels has taught him a lot about the game of basketball. However, it was the harsh lessons he learned as a child, combined with the lessons he has learned teaching children, that have truly prepared him to become a great coach and motivator. Michael knew that if a 10 year old boy with a difficult family life and Tourette's could learn and excel at this game, then any kid with the right tools and coach can learn a skill or learn to play this game at a high level. Michael learned the value a coach can have in a child's life. He realized that thousands of children all over the country quit pursuing their dreams for lack of praise or support. He knows first hand how a single word or action given to a child at the right time in their life can have a profound and long-lasting positive impact. The game of basketball saved Michael's life. He will never forget that confused child who was drowning in a sea of neglect and physical abuse. Yet, he will always remember the Coach who reached down and saved him. It is now Michael's passion for the game and memory of his childhood struggles that truly drives him to help the kids who come to Advantage Basketball Camps. If he can motivate children to keep following their dreams, no matter what life throws at them, then he knows he will have achieved his purpose. Michael's dream is to give all kids a chance and a place to play the game of basketball. He wants to teach them all the skills they need to make their high school teams or beyond. He needs your help to motivate the children, keep them engaged in a gym 12 months a year and off the street, away from drugs, and out of trouble. With just a little attention and guidance, every child can live up to their potential. As of 2006, Michael's oldest daughter Melissa is 27 years old. She has obtained a teaching certificate and is back in school working with and teaching children. She has obtained her masters and is working toward earning her PHD in education..
Michael's son, Christopher, is 18 and is in high school and his youngest daughter, Sarah, is 14 years old. Both are very active in basketball. Michael is currently 49 years old, single, and still very active in coaching and working with kids. When he is not raising his two very independent kids, he focuses his time on Advantage Basketball Camps and his non-profit corporation helping kids across the country. His girls AAU league now has 200 teams. His camps have expanded to 40+ camps in 9 states. They have helped to enrich the lives of thousands of children. He has seen many of his students go on to college on basketball scholarships. Some have even gone on to play professional basketball. Many former students return on a regular basis to help him help new students become all that they can be. Michael's ultimate goal is that, as his students become adults and themselves have children, they will in turn pass along his teachings and messages of hope. As proud as Michael was when his first player made it into the professional leagues, it didn't compare to the to the pride he felt when a young athlete he had not seen in years approached him, now as an adult, with tears in her eyes, and told him the story of how his messages had saved her life. He knew he had completed the circle of kindness, first extended to him by Coach Winners, to make a difference in the lives of so many young people. To this end, Michael consented to share his story. Return to About Advantage Basketball Camps. Register now! Contact us with your questions.